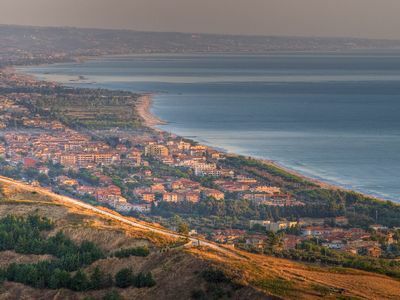 Pineto, the most beautiful country on the Abruzzi coast, rich in greenery, with a marine reserve, with the beach and the sea suitable for families, to be discovered by bicycle or on foot, in full relaxation. We are two brothers, Elisabetta and Gabriele, we love our Abruzzo, Pineto, its lush pine forests and its clean sea. The view from the sea, mind is immersed in swimming, is unique and beautiful, no other country has a view of this type: pine forest, hills and Gran Sasso. Our apartments are located in the north area, in the Villa Ardente district, about 1 minute walk from the sea, 10 minutes walk from the central square and the station, 3 minutes walk from the Catucci pine forest and about 5 minutes walk from the The beginning of the Filiani pine forest. All commercial services are within walking distance. Every day, on the beach in front of the house, fishermen sell their daily catch. Lovely ground floor south side: its plus is the freshness of the rooms and the comfort of access and the fenced yard for exclusive use with independent entrance, it develops inside with a large bedroom with double bed and a bedroom with bunk bed (Sleeps 4), kitchen, bathroom. The courtyard is furnished with chairs, tables, umbrellas and an outside sink.